In a week and a half I am heading to Florida for some much needed relaxation and sunshine. For five days straight, I have nothing planned except getting a start on my summer tan. What could be better than that? The only downside to my mini vacation, however, is trying to find a swimsuit. For obvious reasons, my suit from last year does not even come close to fitting and I'm pretty sure I threw it out sometime last fall. For the lucky few people who actually enjoy swimsuit shopping, I seriously envy you. For the rest of us, on the other hand, it can be one of the most dreaded days of the year. After recently gaining a significant amount of weight, I wasn't even sure if I had the guts to enter a fitting room to begin the process of finding the right fit. Earlier this week, to my surprise, I did find the courage to do a little swimsuit shopping. Over the past few months, I have learned some great shopping strategies to help keep my body image in check. My favorite is to grab a bunch of different sizes, bring them to the fitting room, try them on WITHOUT looking at the tag, and just go with the one that fits the best. If I am being completely honest, I had planned on buying a one-piece to cover up my new shape. Thankfully as I was looking at the suits, however, I decided I was way too young to go for the one-piece. After trying on what felt like every single suit in the store, ironically, I went with the very first one I tried on. Why does that always seem to happen? It fit perfectly, it is my favorite color, pink, and it is a size XL. Yes, I did stupidly give in and look at the size on the tag, which almost gave me heart attack. Am I really a size XL?! Am I crazy for posting these pictures? Absolutely. Is my body at a healthy weight? Yup. Did I spend hours in the gym before swimsuit shopping? I haven't worked out in over a year. Do I eat Reese's peanut-butter cups everyday? Religiously. Am I 45-50 pounds heavier than the last time I wore a swimsuit? Yes. For the first time in a decade, I am not obsessing about the amount of weight I want to lose before spring break. The swimsuit I bought fits my body now, rather than the body I dream of having; even if it is an XL. 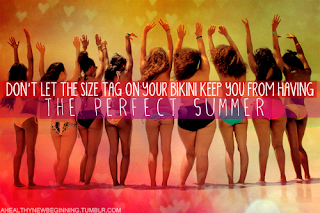 When I was underweight and very sick, I always wondered why they even made bikinis above a size small. As I type that now, I realize how incredibly ridiculous and flat out rude that sounds, but when I was sick, I honestly did not understand how anyone above a size 2 could feel comfortable in a swimsuit. 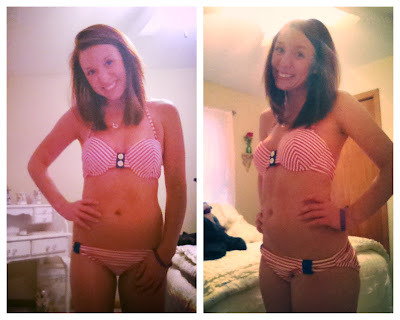 As much as I was dreading swimsuit shopping, it actually turned out to be somewhat of a turning point in my recovery. I know I have said it a million times and even wear a bracelet that says "numbers do not define me," but for the first time I really, truly believe it. In this particular swimsuit, I'm a size XL and - dare I say it - I feel pretty darn good in it. Wow, Kelsi where do I begin? This post just made my whole entire day. I was all worked up these past few weeks and my body image has been at an all time low, and reading this post just totally switched my mood. You are so brave and honestly I look up to you!!! I hope one day I can be half the woman you have become, you truly are an inspiration. You are beautiful. Your smile, your hair and you body must drive a bunch of man crazy, isn't it ? I'm actually trying to recover from my ED and this picture gives me hopes... Bones are not that beautiful, I can tell you. Yup, you can absolutely stop working out, enjoy, food, be happy, and carefree! Just keep up the good work- your hard work will pay off. I promise! I don't feel good everyday, but the good days have started to outweigh the bad days, so that's all that matters. I LOVE this!! This is the first time I've commented but I've been reading for a while. I'm Katy from Libero, by the way! You look great in your swimsuit and have nothing to be ashamed of. I can't believe it's an XL... then again, who really cares what the tag says, people will see you wearing it not the tag. However... the "Say Hell No to Size Zero" image makes me extremely sad. I'm 5'0" (okay, I'm 4'11" and 3/4 according to my doc), and I'm a size zero. I don't look unhealthy, I don't eat Reeses every day (but I do have ice cream most nights), and this is just my frame. I do work out and run a lot, but I love it and it makes me happy. Yes, society promotes thinness, but I don't think shaming someone who may legitimately be a certain size without eating only salads to get there is the way to go :(. I honestly did worry about that as I was posting this, but it is not meant in anyway to make you (or the other size zeros out there) feel shameful. I do apologize for that. However, that picture does have the NEDA recovery symbol on it, so I thought that helped direct it towards eating disordered people. All that matters is that you are healthy and happy. Thanks for bringing awareness to this topic, I will be more mindful in the future. I want to start by saying you look INCREDIBLE in your swimsuit!! XL is crazy, sizes are getting too small these days! I greatly respect you for your thoughtful response to Amy's comment (SUPER thoughtful!! ), and thank you for resolving to be more mindful of smaller framed people! I did want to let you know that there are more of us out there! I am 4'11 as well, and when I'm eating and working out like I should, I am a size 0/1. (If I get lazy and don't have the added muscle mass, I am a 00.) I work very hard every day to be as "big" as I am now, so the "Say Hell No to Size Zero" picture was offensive to me. I did not recognize that there was a NEDA symbol on it, so knowing that makes me feel a little better! However, I agree with you that numbers do not matter at all as long as you are healthy, so when actual sizes get called out as 'unhealthy' (which is usually any size below a 2) it makes me sad. Again, thank you for being so receptive to Amy's comment! You might be surprised to know how many people are generally bitter toward smaller people! Your response was so refreshing to read! Again, I never meant to insult or cause anyone to feel shameful. My mom is actually one of those naturally tiny people, so I really should have reconsidered posting it. Everyone's body frame is different and like I said, I will be much more mindful of the pictures I use in the future. I am all about excepting your body at its healthiest state and for some people (like you & Amy!) that is a size 0. Not to be forward, but what bmi did you recover to? You look great! And seriously thank you for posting these pics: It really helps me (trying to gain weight) feel better about wearing bikinis again. You really look great, healthy, happy, and full of confidence. After looking at those pictures, I would have never in a million years guessed you had an ED. You look happy, healthy, and very confident, like you've been living in that body your entire life. Work it, girl!